Chateau Destieux does not take its name from a former owner, or the founder of the estate like so many Bordeaux wine producers. History is not exactly sure. But it is probably the amazing vista’s that can be seen from the top of the slopes on the property that inspired the estate’s name. Destieux is an archaic, French term that can be loosely translated to “des yeux” or “eyes.” From the Destieux vines, wine lovers get a bird’s eye view of the Dordogne river all the way over to the neighboring appellation of Montagne St. Emilion. For a point in time, the wines were sold under the name of Destieux-Berger. The estate changed hands in 1971 when the vineyards were sold to the Dauriac family. The debut vintage of Chateau Destieux under Christopher Dauriac was produced in 1976. Today, the Dauriac family also own 2 other estates in the Right Bank, Chateau La Clemence in Pomerol as well as Chateau Montlisse, which is also located in the Saint Emilion appellation. 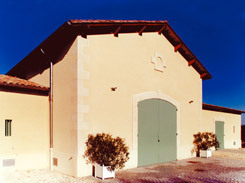 In 1999, the winemaking facilities of Chateau Destieux were greatly improved. To modernize their winemaking, they added eight new, temperature controlled, 45 hectoliter wood vats which allowed for the wines to be vinified on a plot by plot basis. Chateau Destieux is consulted by Michel Rolland. The 8 hectare vineyard of Chateau Destieux in Saint Emilion is planted to 66% Merlot, 17% Cabernet Franc and 17% Cabernet Sauvignon. The terroir is chalk and clay soils on a plateau, with slopes. At its peak, the vineyard rises to 100 meters, making it one of the highest elevations in the appellation. The vineyard is in one single block of vines that can be divided into 8 separate parcels, which now match the 8 oak, fermentation vats, allowing for parcel by parcel vinification. One interesting bit of trivia for you is that each of the 8 oak fermenters was produced by a different cooper. The vineyard boasts old vines, many of which are between 40 to 50 years of age. Malolactic fermentation takes place in 100% new, French oak barrels. The wine of Chateau Destieux is then aged in 100% new, French oak for barrels between 15-24 months depending on the vintage. 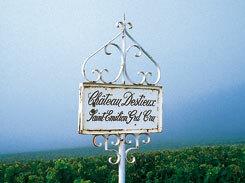 On average, between 2,500 and 2,800 cases of Chateau Destieux are produced every year. There is a second wine, Reflets de Destieux, which was previously sold under the name of de Laubarede. Chateau Destieux is better with at least 3-5 years of bottle age. Of course that can vary slightly, depending on the vintage. Chateau Destieux is best enjoyed in the first 5-18 years of life. Young vintages can be decanted for about 1 hour to 90 minutes or so. This allows the wine to soften and open its perfume. Older vintages might need very little decanting, just enough to remove the sediment. Chateau Destieux is best served at 15.5 degrees Celsius, 60 degrees Fahrenheit. The cool, almost cellar temperature gives the wine more freshness and lift. Chateau Destieux is best served with all types of classic meat dishes, veal, pork, beef, lamb, duck, game, roast chicken, roasted, braised and grilled dishes. Chateau Destieux is a perfect match with Asian dishes, hearty fish courses like tuna, salmon, mushrooms and pasta as well as cheese. Aside from his 3 estates in Bordeaux, Christopher Dauriac also consults the Marianne Wine Estate, located in the Stellenbosch appellation in South Africa. Medium bodied with sweet black raspberry, vanilla, licorice and espresso, this wine is forward and fun with a crowd-pleasing style. Licorice, juicy, sweet, black fruits and salty, polished tannins give this wine freshness and sweet, ripe fruits from start to finish. Medium bodied, light in color, soft textured red plums and cherries in the short finish. Short, medium bodied, bright and filled with red fruits and new oak, drink this on the young side. Open, forward and round in texture, the wine is filled with licorice, espresso beans, ripe black cherries and earth. Licorice, black plums, blueberry, chocolate, coffee, vanilla and smokey notes create the perfume, Full bodied, rich, round and packed with layers of sensuous, ripe, sweet, dark berries, cherry and cocoa, this is the best wine I have tasted from Chateau Destieux. Medium bodied and ready to go, the earthy cherry, red plum, thyme, forest leaf and tobacco notes shine through the nose and carry through to the round, fresh, palate. The wine was made from a blend of 66% Merlot, 17% Cabernet Franc and 17% Cabernet Sauvignon. From an assemblage of 66% Merlot, 16% Cabernet Sauvignon and 16% Cabernet Franc, the wine offers red and black fruit, stone, earth and coffee scents. Medium/full bodied, soft in texture, the wine ends with black raspberry and licorice notes. Licorice, blackberry espresso, smoke and boysenberry aromas lead to a powerful, sweet, round textured St. Emilion that will be drinking great with another 2 - 5 years of bottle age. Opulent, round, ripe fruits, licorice, dark cocoa, black cherry liqueur and fig notes are all over the place, on your palate and in the perfume. This is drinking about as well as it's going to get. Short and sweet, easy to drink, with its soft, open, medium bodied, cherry, licorice, earth and smoky character, this requires drinking over the near term. Fully mature, round and fleshy in texture, with licorice, truffle, earth, black cherries, mocha and espresso to create its character. Easy to drink, no decanting required. Fully mature, medium bodied and showing just as much, earthy, dark red fruits as it does thyme, tobacco and espresso, the wine is soft and easy to drink. If you have a bottle hanging around, pop a cork as it is only going to drop fruit from here.